On this, our fifth episode, our guest is Mat Alano-Martin. Mat is a stand-up comedian who comes to comedy from the world of rock 'n' roll, where he spent 10 years touring North America as a member of several unknown bands and as a tour manager for much more successful, well known bands. 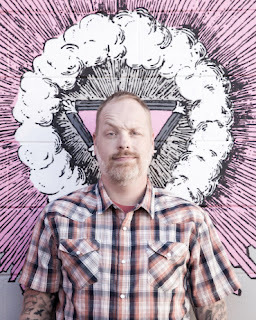 With a comedic style that bridges the social and political views of his indie-rock background with the attitude and sensibilities of his rural and blue collar youth, Alano-Martin has appeared at comedy clubs, theaters, punk rock dives, redneck roadhouses, casinos, colleges, living rooms and everywhere in between. Alano-Martin’s debut album “Profiled as Such” can be heard on the Sirius/XM Raw Dog comedy channel, and he has appeared on the nationally syndicated The Bob & Tom Show, Laughs on Fox TV and at several festivals and prominent showcases across the country. He is also the co-founder of the Limestone Comedy Festival, which runs from June 2 to 4, 2016 in Bloomington, Indiana, and the Arch City Comedy Festival, which runs from August 25 to 27, 2016 in Columbus, Ohio, and the host of the Strangers On This Road podcast. He has worked for Funny Business Agency, Comedy Zone, Tribble Run and many clubs around the country. You can find Mat's official website at mat-alano-martin-comedy.com and you can follow him on Twitter. You can find the Limestone Comedy Festival on Twitter and on Facebook. You can find the Arch City Comedy Festival on Twitter and on Facebook. Thank you to everyone who went to iTunes and subscribed to, rated and reviewed The Rob Burgess Show. The initial results are in, and the average rating so far is five out of five stars. It doesn't get any better than that! If you haven't subscribed to, rated and reviewed the podcast on iTunes yet, please do so now, so we can keep the momentum going. Every little bit helps the podcast to reach an even wider audience. You can find it at tinyurl.com/therobburgessshow and once you're signed in to iTunes, hit "Subscribe." Click the tab on the iTunes page near the top that says "Ratings and Reviews." From there, please leave a star rating (hopefully five stars) and click "Write a Review" to leave a review. Thanks again for the support! If you're an Android user and you're still not sure how to listen, you can also visit the website subscribeonandroid.com/tinyurl.com/therobburgessshowrss and if you have a one click supported app on your Android device, the app will load automatically. At this point, The Rob Burgess Show should now be listed on most of the major podcast directories, but if you're still having trouble finding it or know of a directory I've missed, please let me know.